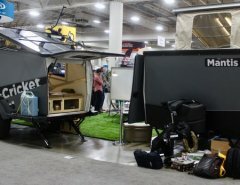 MSRP: Starting at $118,495 USD. 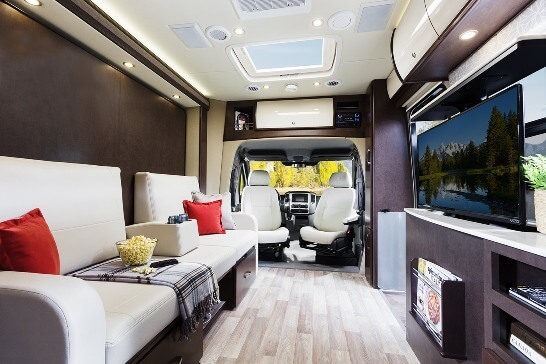 The 2015 Leisure Travel Vans Unity MB’s revolutionary all-new Leisure Lounge system is very versatile, has an open feel and allows for 6 completely different seating and dining configurations. 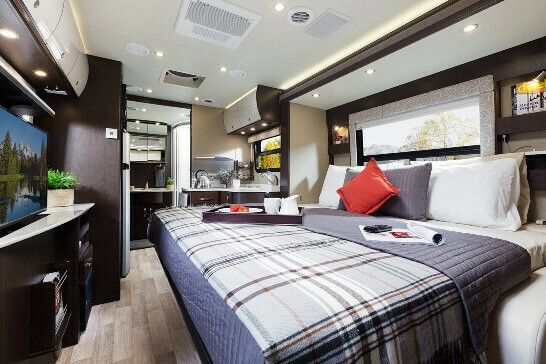 It also features a residential-style queen-sized murphy bed, a pop-up 32” LED TV, curved European cabinetry throughout, and a 27.5 sq. 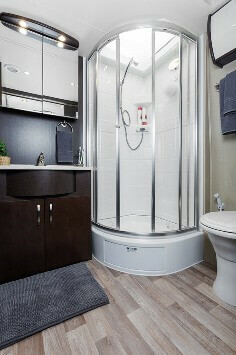 ft washroom to make any Class A envious, the U24MB is one big “little” motorhome. Shown is the 50th Anniversary Décor Package that consists of Espresso Brown Cabinetry, Gloss Cream Upper Cabinets, White Corian Countertops, Indirect LED Accent Lighting. 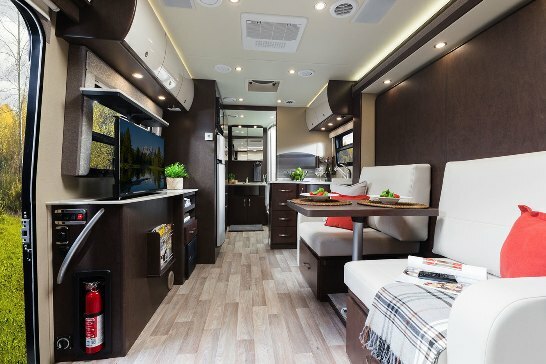 Regardless of whether you choose the rich luster of cherry, Espresso Brown or the contemporary European style of sierra maple, Leisure Travel Vans solid wood curved cabinets offer seemingly infinite storage with unbeatable style and quality. 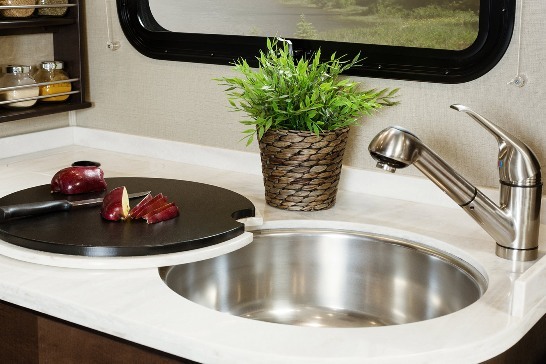 And, to keep your belongings safe on even the roughest terrain, they’ve included brushed stainless steel positive locking pulls on all upper cabinets. 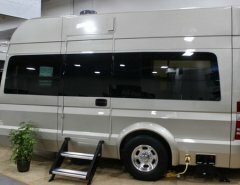 As for drivability, the Unity is flexible and versatile making driving an RV easy as pie. 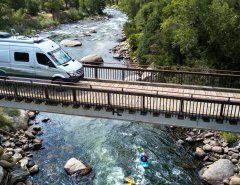 So, whether you’re navigating a fast food drive-thru or searching for the best camping spot around, the Unity’s size and turning radius will help you travel with confidence. One of the best features is the residential-style queen-sized 68”x74” murphy bed. It’s conveniently tucked away behind the Leisure Lounge when not in use and with the slide-out extended gives plenty of room in the living space to move around. There is storage space behind the bed for pillow so everything is right there when you need it. Everything about the Unity’s exterior appearance is clean, stylish and aerodynamic. 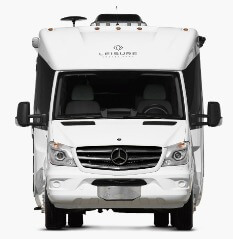 From the contoured walls to the awning style frameless windows to the LED exterior clearance lighting, the exciting European design will make an impact wherever you go. Mercedes-Benz 3 Liter V6 BlueTEC Turbo Diesel – 188 hp/325 ft-lb w/ Mercedes 5-Speed Auto Trans.